You can choose the display type of slider background. It can be background image, color and video. Cover: The most common option. This will ensure that your image will always fill the entire size of the slider. Click here for information about “Background Position”. Click here for information about “Background Repeat”. Add Instragram-type filters to your slide’s background image. 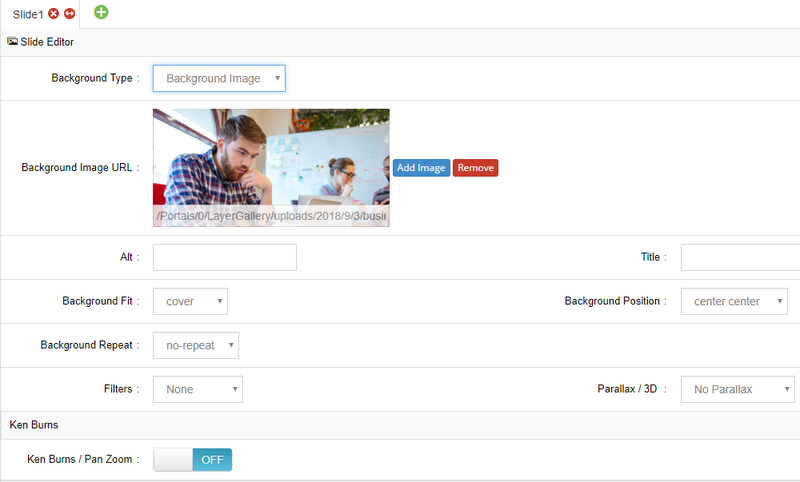 To use this option, first make sure “Enable Parallax” is set to “ON” in the slider’s main parallax settings. Adding a parallax level here will apply some movement to the main background based on mouse-move, scrolling, or both. An elegant pan/zoom that will move and scale the main background image slowly after the slide comes into view. Use a solid color as the slide’s main background. To get your YouTube ID, visit the video on YouTube.com, and view the url in the browser’s address bar. The ID will be after the “v=” part of the url. In the following url example, the ID is “AkcUoA2f-jU”. The video’s “cover” is what will animate when the slide first appears. ON: Have the video cover the entire size of the slider (usually the best option for video backgrounds). Depending on the video’s Aspect Ratio in relation to the slider’s size, cropping may occur. OFF: The video will always respect its Aspect Ratio, and will never be cropped. Depending on the video’s Aspect Ratio in relation to the slider’s size, blank space on the sides of the video may occur. Choose to display a “mesh-like” transparent graphic on top of the video, adding some extra style to the video. YouTube offers 2 versions of the video that can be loaded which are 16×9 or 4×3. For video backgrounds, 16×9 is usually best. 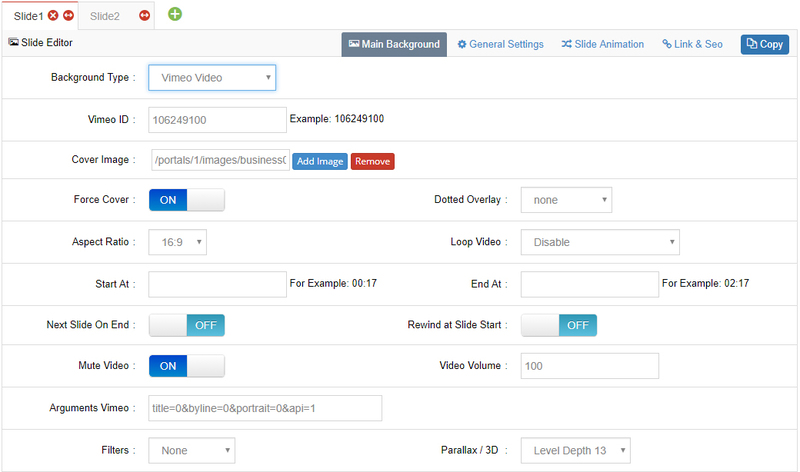 Choose to start the video at a specific time, in minutes:seconds format. Disable: Video will only play once each time the slide is shown. Loop – Slide is paused: Video will loop endlessly. Loop – Slide does not stop: Video will loop endlessly until the slide’s delay is reached. ON: Slide will immediately change as soon as the video ends. OFF: If video’s length is less than the slide’s delay, the slide will not change until the delay time has been reached. ON: Video will always start from the beginning each time the slide is shown. OFF: Once the video plays, if the slide is changed before the video actually ends, when coming back to the same slide, the video will resume playing from the same point. Choose to mute the video’s volume if it normally has sound. A special option to play the video at a “fast forward” speed. Additional parameters that can be passed to the video from this list. To get your Vimeo ID, visit the video on vimeo.com, and view the url in the browser’s address bar. The ID will be after the “vimeo.com/” part of the url. In the following url example, the ID is “106249100”. Vimeo offers 2 versions of the video that can be loaded which are 16×9 or 4×3. For video backgrounds, 16×9 is usually best. Choose to start and/or end the video at a specific time, in minutes:seconds format. 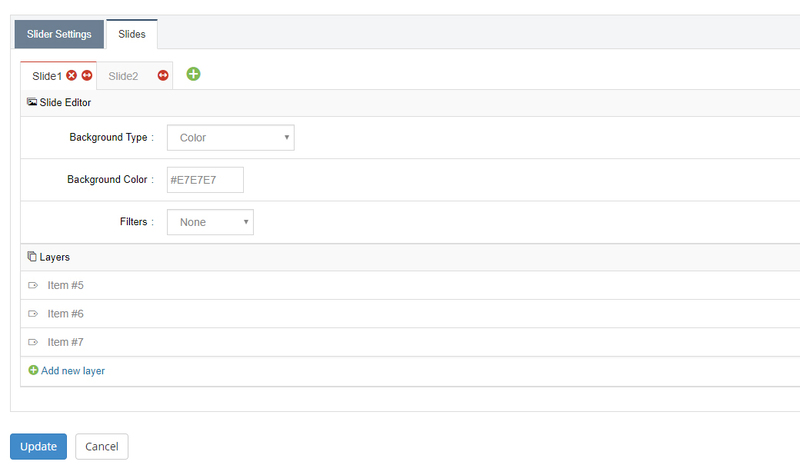 Upload a video to your site via ftp, and enter the full url of the video in the fields. An “MPEG” version of your video (a file ending with “.mp4”) is mandatory. MPEG will work almost everywhere except Firefox on Macs. Because of this, it’s also important to include an alternative version of the video, which can be either “WEBM” or “OGV”. Firefox on Mac supports both of these, so you only need one or the other. 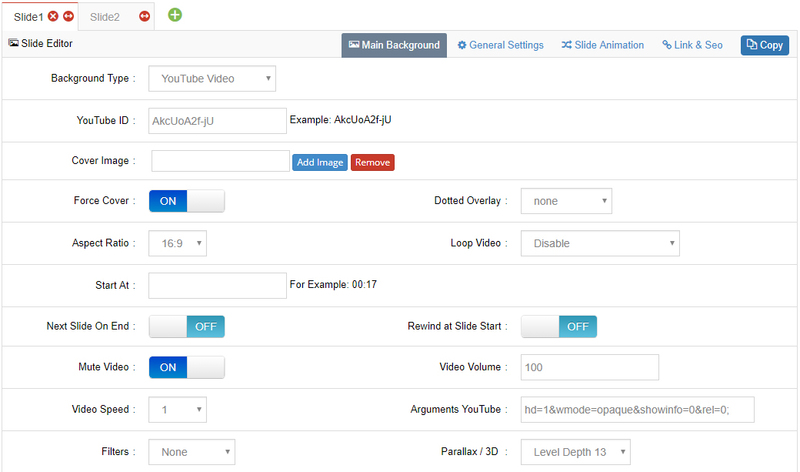 Here’s a free tool you can use to create “ogv” and “webm” versions of your video. Choose which aspect ratio the video should be resized by. For video backgrounds, 16×9 is usually best.